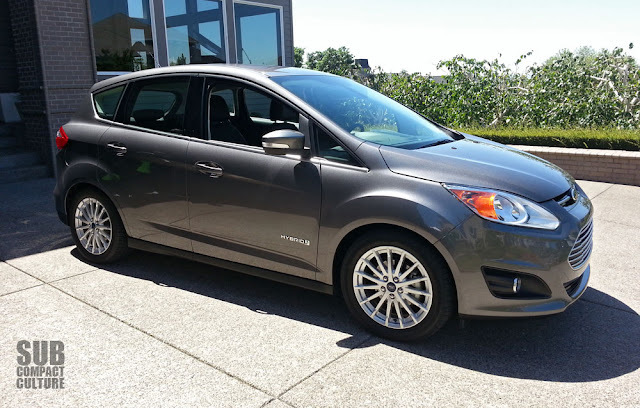 In the driveway this week is Ford's 2013 Cmax Hybrid. Ever since I saw the C-Max, I loved its looks. It's my favorite everyday hybrid in terms of aesthetics. The interior also looks great. It's size is also great. It's not very big, but it has a spacious interior. So far, I've got about 55 miles on it, most of which are highway miles, and I'm getting and above EPA-estimated 46 MPG. The car drives very nicely so far with well-weighted steering, a quiet ride, and the handling is remarkable for a hybrid. So far, I'm quite impressed. One thing: The turning radius seems awful large.